Welcome : very sweet love is lady! Room : my bed was awesome and th shower was nice also cant wait to go back. Breakfast : nice and fresh crossants with jam was my favorit! From 60 to 115 € the night I book ! 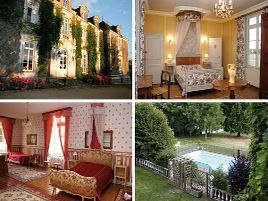 Just half an hour from Mans, an 18th century family chateau, set in large grounds with two-hundred-year-old trees. Spacious, comfortable rooms with high ceilings, canopied beds, large mirrors, period furniture... Hearty breakfasts. Traditional cuisine prepared with local products. Warm, easygoing welcome..
- pêche sur place dans le Loir et la Sarthe. - golf du Circuit à 17 km. 2 suites and 3 rooms with bath or shower, WC. 60 euros (1 pers. ), 80 euros (2 pers. ), 95 euros euros (3 pers. ), 115 euros (4 pers.). Extra bed 20 euros. Baby equipment, babysitting, children's meals. For teenagers: swimming pool, table tennis, pétanque. Rooms suitable for families. The closest station is Le Mans, located at 25 km. The closest airport is Tours, to 60 km.